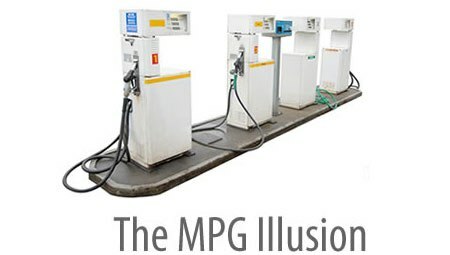 The MPG Illusion Website: CAFE Math -- Percent cleaner versus percent further? CAFE Math -- Percent cleaner versus percent further? The Obama administration has proposed raising CAFE standards from an average of 25 MPG in 2009 to 35.5 MPG in 2016. We applaud this improvement because it accelerates gains that were planned for 2020. Detroit has signed on. However, we note that MPG has again caused confusion. Many prominent sources have interpreted the improvement from 25 to 35.5 as "40% cleaner" and as cutting "tailpipe emissions by almost 40 percent." Before exploring the percentages, it is important to note that CAFE math is hard to interpret in general because it describes the average new vehicle sold in the fleet that year, and does not adjust either for an increase in total vehicles sold or for increases in the miles driven, both of which will diminish actual CO2 benefits. With that caveat, here's the right way to think about the increase of the average car's MPG from 25 to 35.5. It is true that there is a 40% improvement, which can be seen by taking the difference between 35.5 and 25 (10.5), and dividing it by 25. However, this number does not tell you how much cleaner the average car is in terms of CO2 emissions. Instead, it tells you how much further you can now drive in a new vehicle on the same gallon of gas. One gallon will now take you 40% farther than it did before. For example, a 100% increase in MPG reduces GPM by 50%. A 50% improvement in MPG reduces GPM by 33%, and so on. CO2 is reduced as a linear function of changes in GPM, not MPG. Note that CAFE calculations, which are based on the harmonic mean of all vehicles sold by a manufacturer, inherently involve GPM. The harmonic mean is simply a weighted average of GPM that is then flipped and expressed as MPG. Carolyn Fischer at Resources for the Future has written a brief describing several benefits of switching from MPG to GPHM ("gallons per hundred miles"), including the ability to administer CAFE credits. The government routinely uses GPM for these calculations; why not make it a general practice? Thanks to Frank Wang and Drew Carton for pointing out these misinterpretations of the CAFE increase.